This study aims at developing mechanisms to generate fund for road safety improvement with a case study of Kerala state. As there is no mechanism available to assess the fund requirement for road safety improvement, a rationale was developed by studying the road safety Investment pattern of London. The relation between expenditure towards road safety and improvement in terms of reduction of road accidents over a period of time was considered. India, experiencing around 150,000 deaths annually has overtaken China and now has the worst road traffic accident rate worldwide. Out of this, Kerala in India accounts for 3.2%. It is a challenge to take forward the infrastructure to meet the growing number of vehicles. Road safety improvement requires high investments and frequent upgrades of the traffic facilities. But India, being a developing country has its own limitations in funding road safety improvement. Most transport projects do not have mandatory measures to invest adequate funds to make the road infrastructures safe. There is hardly any amount spent on PWD road projects in relation to road safety. Recently, the Committee on Road Safety of the Government of India suggested the release of at least 10% of the total funds allocated to the state governments from the cess on diesel and petrol to ensure road safety for transport projects. While mentioning the allocation of road safety fund, there is no attempt made to evolve the criteria to invest adequate money on a scientific basis. In fact there is no mechanism available to generate any road safety fund. An expenditure of $45.78 million has been made towards road safety in 2012-13, which was $20.41 million in 2007-08. A total of $182.72 million have been invested towards road safety in last six years. The United Kingdom is an international example of the best practices in road safety activities. A case study on the investment made towards road safety improvement in London is considered as it presents a remarkable outcome in the reduction of road accidents. 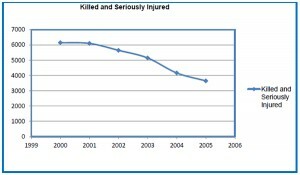 The death and serious injury count in London, which was 6150 in the year 2000, had been brought down to 3650 by 2005 with a total investment of 139 Million GBP during this 6 year period. 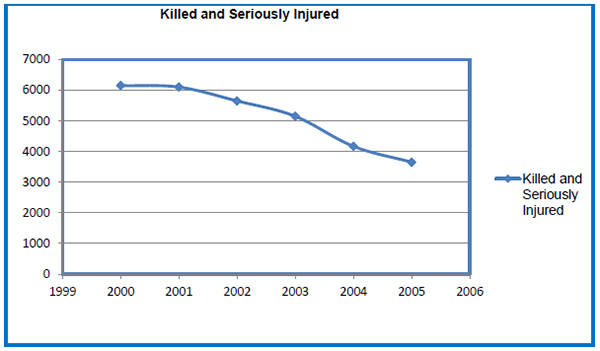 The tables shown presents in detail the increase in funding and the subsequent reduction in the count of Fatality and serious injury. It also depicts the annual investment for road safety per lakh (100,000) population. 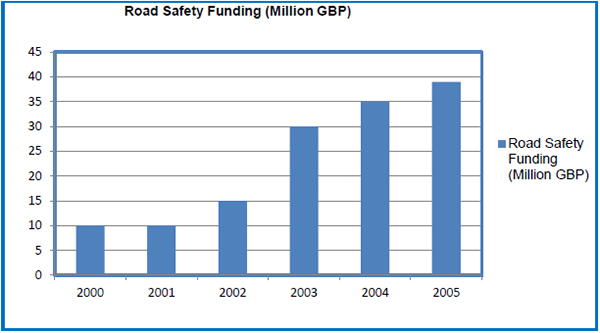 The road safety fund of 10 million GBP in 2000 and 2001 rose to 39 million GBP by 2005. 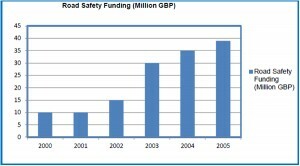 Figure-1 shows the reduction in the number of fatalities and serious injuries during the period from 2000 to 2005 and Figure-2 shows the increase in funding towards road safety improvement. Combining the savings from reduction infatality, major injury and minor injury in London, a total benefit of 783.75 million GBP was obtained. This figure has been worked out by multiplying the number of accidents reduced with the respective accident costs.